Avocado is a rich source of healthy fat. What is healthy fat, you ask? Healthy fats are monounsaturated fats which, according to the American Heart Association, decrease harmful LDL cholesterol, raise beneficial HDL cholesterol and last but not least, lower your risk of stroke and heart disease. One-half cup of guacamole contains 15 grams of fat. The majority, about 10 grams of the 15, is monounsaturated fat, the California Avocado Commission says. There are only 2 g of saturated fat, and no cholesterol. Finally, the avocado is an excellent source of vitamins B-6,C, K and Folate, and the minerals: copper and potassium. Folate is necessary for your body’s production of red blood cells, and it decreases your risk for cardiovascular disease. Vitamin C aids in healing by increasing the absorption of calcium and iron,and maintains healthy teeth, bones, gums and blood vessels. Vitamin B-6 is vital for the normal function of your neurological system, and potassium is necessary to maintain normal heartbeat and blood pressure. Avocado is high in oleic acid, which has been shown to prevent breast cancer in numerous studies. One-half cup serving of avocado also provides about 8 grams of Fiber, too. Fiber is found in all plant-based foods, and promotes normal bowel function, reduces the risk for heart disease (a healthy heart is a happy heart!) and diabetes by lowering your glucose and cholesterol levels, according to MayoClinic.com. All in all, sounds like every day should be guacamole day! P.S. – This is a really cool website you should check out for tips, recipes, and facts about the amazing avocado. 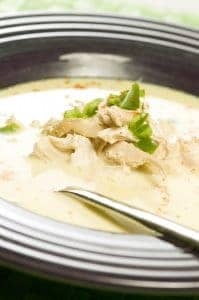 Soups and stews are my favorite fall dishes, and since the temperatures in Albuquerque have dropped 20 to 25 degrees, I’m getting ready for the autumn soup season. Chicken, jalapeños, and half and half make a perfect start! Here is an innocent-looking soup that is hotter than it appears. The combination of chicken and chiles occurs often in all Southwestern cuisines but the use of jalapeños is more prevalent in Texas. Combine the jalapeños, chicken, onion, celery, carrots, garlic, cumin, and water in a pot. Bring to a boil, reduce the heat, cover and simmer until the chicken starts to fall off the bones. Remove the chicken and bones and reserve the stock. Remove the skin and fat from the chicken and shred the meat. Puree the stock and strain the mixture so that it is smooth. Pour 3 cups of the stock into a large saucepan, add the half and half, and heat through. Add the chicken and continue heating through. Pour into bowls and garnish with the finely chopped jalapenos. 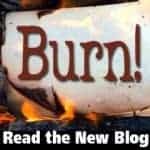 For more spiced up recipes, be sure to visit the Burn! 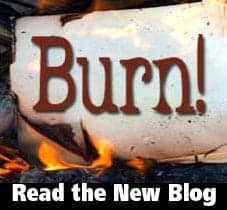 Blog, the official blog of the Fiery Foods & Barbecue SuperSite, here. There are many versions of the popular sangrita, a chaser for a straight shot of tequila. 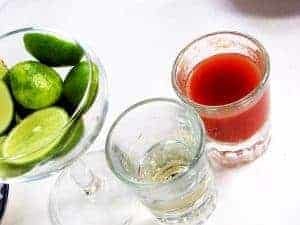 It is common in Mexico City to serve premium tequila accompanied with sangrita, a favourite of my family. There always seems to be a batch of this sophisticated sangrita in the fridge. The Spaniards brought with them to La Nueva España (New Spain), their knowledge of the distillation process learned from the Moors, giving birth to one of the most wonderful beverages: Tequila. Agave tequilana Weber is the scientific name of the cactus that produces tequila. This agave plant grows in a semi-dry climate in clay-like soil with a high basalt and iron content, conditions that are found mainly in the State of Jalisco, around the city of Guadalajara where the township of Tequila is located. Tequila is aged in white oak casks. Once this process is finished Tequila is ready to be bottled. The name ‘Tequila’ is protedted and recognized as a native beverage. In a bowl, mix the onion, cilantro and chiles with the V-8, lime and orange juices. Add the Worcestershire, Jalapeño, and Maggi sauces, and salt and pepper to taste. Transfer the sangrita to a glass pitcher and refrigerate, covered, overnight or for several hours before serving. Maria Elena Cuervo-Lorens is the author of Mexican Culinary Treasures cookbook. She takes you back to her childhood, spent around her grandmother’s table on a shopping expedition with her mother to Mercado La Merced, and for a merienda (snack) of café con leche and bizcochos (Mexican sweet rolls) at a bakery in downtown Mexico City. The authentic Mexican recipes she shares with us include tacos, quesadillas and enchiladas. The nouvelle cuisine of cosmopolitan Mexico City, such as cuitlacoche (huitlacohe) crepes, oysters with chipotle chile. There are many more recipes of cocktails with tequila on pgs. 212 and 213 of her book. Cooking meats in the pibil method dates back to Pre-Columbian times and variations of these dishes can be found in just every restaurant that features local cuisine throughout the Yucatán Peninsula in Mexico. 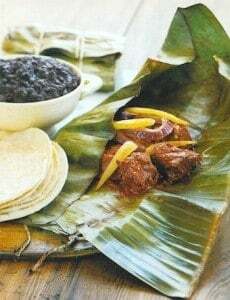 This method of cooking is done in a pit lined with stones called a pibil which were the center of the Mayan community. This is a easier variation that can be done on the grill or in a smoker, and doesn’t require digging a pit in your back yard. Achiote paste is made with annatto seeds, which is used both a spice and an orange coloring agent. I prefer using the paste, rather that the seeds which are as easy to grind as steel ball bearings. Güero chiles are substituted for the usual xcatic chiles which are impossible to find outside of the area. Banana leaves can be found in Asian markets, but you can also use aluminum foil. Pibils are traditionally served with pickled red onions. Note: This recipe requires advance preparation. Cebollas Encuridas (Pickled Red Onions), see recipe below. Place the peppercorns and cumin seeds in a spice or coffee grinder and process to a fine powder. Combine the powder with the garlic and habanero chile and place in a blender or food processor and puree. Combine the spice mixture, achiote, oregano, bay leaves, and lime juice. Put the chicken in a non-reactive pan and prick with a fork. Pour the marinade over the chicken and marinate overnight or for 24 hours in the refrigerator. To make 4 packets, cut 8 pieces of string about 6 inches long. Lay the strings down on a flat surface, place 4 banana leaves on top of the strings. Place a chicken on each the leaves along with the marinade and top with the chiles and onions. Place a little epazote on each breast along with a tablespoon of margarine. Fold the banana leaves over the meat and tie with the strings. Place on the grill over indirect heat and cook for 1 hours, or in a smoker on the grill with pan of water between the coals and the wrapped chicken to keep the chicken juicy. Serve the chicken with warm corn tortillas, pickled onions, and black beans. These colorful onions are a traditional accompaniment to pibil dishes. Found on virtually every table throughout the Yucatan, they will keep for a long time in the refrigerator. Place the onions in a bowl and pour boiling water over them. Let them sit for 1 minute and then drain. Discard the water. Coarsely grind the peppercorns, allspice, and cumin seeds in a spice or coffee grinder. Add to the onions. Add the remaining ingredients, and enough water to barely cover. Allow the mixture to marinate for a couple hours to blend the flavors. The Rosca de Reyes, or ring-shaped Rosca de Reyes is a sweet round, cake or oval shape Mexican bread, decorated with slices of crystallized or candied fruit colors. The King cake is also called: biscuit, cake or sweet bread to celebrate the three kings. The celebration of Epiphany to enjoy the Rosca de Reyes is a Mexican tradition that takes place, 12 days after Christmas, each year in social reunions with family, friends or colleagues in offices or homes. This meeting is usually done a few days before or after January 6 at the offices or places outside the home, however for the family reunions they are normally held in homes on the sixth day of January in the evening, Epiphany Day or the appearance of the Wise Men or Magi Kings: Balthazar, Melchior and Caspar. and it is important when you cut a slice, that on both sides of the rosca, does not appear the figure of the infant Jesus (plastic doll symbolizing Jesus newborn). It is worth to mention that also a small showing inside may bearly appear in the sweet bread. Now in days another figure of a Wise Men of plastic may be hidden inside the bread, so that two people who are to split the party cost. It is said that the person who finds the baby Jesus, should put the house for a party on Candlemas Day on February 2. On this day your guest are expecting to eat tamales and Mexican appetizers, so it is important to re-join the same group that was present when the rosca was cut. Incidentally, the person who finds the plastic wise man or Magi King in his or hers slice, normally must pay the costs of the party, in reality the expenses of the party is shared by both persons. It is considered to have good luck and that you are fortunate if you find the baby Jesus and/or the Wise Man. The tradition of holding the reunion to celebrate the Day of the Epiphany comes from the middle ages in Europe, mainly from Spain and France. This tradition came to Mexico at the time of the early years of the viceroys. 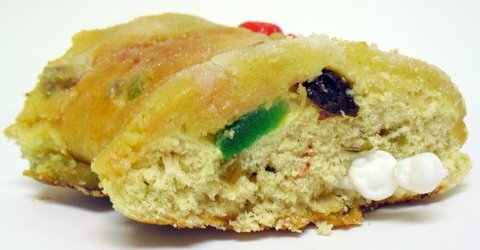 La Rosca de Reyes, roscón o rosco de reyes es un pan dulce festivo en forma redonda u ovalada, adornada con rodajas de fruta cristalizada o confitada de colores. Los Roscones de Reyes tambien se denominan: biscocho, pastel o pan de dulce para celebrar los reyes magos. La celebración del Día de Reyes para partir la Rosca de Reyes es una tradición Mexicana que se lleva a cabo cada año juntando amistades cercanas ya sean familiares, amigos o compañeros de trabajo en las oficinas o casas. Esta reunión normalmente se hace unos días antes del 6 de Enero en las oficinas o lugares fuera de la casa y para las reuniones familiares se celebran en las casas el día seis de Enero en la tarde, día de la Epifanía o aparición de los Reyes Magos: Melchor, Gaspar y Baltazar. y que vean todos los presentes, que por ambos lados del corte no aparezca la figura del niño Jesus (muñeco de plástico que simboliza a Jesús recién nacido). Vale la pena mencionar que actualmente también se esconde adentro del pan de dulce o rosca: otra figura de Rey Mago de plástico para que exista la oportunidad de que sean dos las personas que los encuentren al partir la rosca y se dice que la persona que se saca o encuentra al Niño Jesus, debe poner la casa para hacer una fiesta el dia de La Candelaria que es el 2 de Febrero. Ese dia se comen tamales y antojitos Mexicanos y se vuelven a juntar el mismo grupo que estuvo presente cuando se partió la rosca. Por cierto, la persona que se saca en su rebanada el Rey de plástico es el que normalmente debe pagar los gastos de la fiesta, pero en la realidad la fiesta la hacen ambas personas poniéndose de acuerdo y se considera que tienen buena suerte y que son afortunadas por encontrar al Niño Jesús y al Rey Mago. 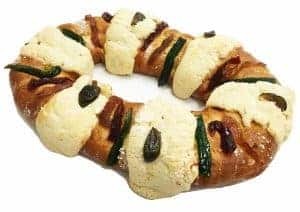 La tradición de celebrar la reunión de cortar las Roscas de Reyes, rosca de pan dulce o Roscón viene desde la Edad Media en Europa, principalmente en España y Francia. Este celebración llego a México en la época de los primeros años del Virreinato. The first Spaniards to be introduced to the turkey in 1511, were the castaways of the caravel “Santa Lucía” during a voyage from St. Maria of Darien, a colony situated between Panama and Colombia, and the island of “La Española”, currently known as Haiti and the Dominican Republic. The commanders Guerrero and Aguilar were greeted on the island of Cozumel, and one of the first things they enjoyed was turkey meat, that which was already quite common on the island and in the whole south eastern peninsula of Yucatan. However, for historic reasons the first description of turkey only came around the year 1519 through the historian Bernal Díaz del Castillo. He called it gallina de la tierra (hen of the land) and not by its Náhuatl Indian name of huaxólotl, a name which the Spaniards could not pronounce, therefore they changed the name to guajolote (turkey). Captain Fernández de Oviedo another noted historian, introduced the turkey to Spain in the year 1523 and by the year 1525, everybody was talking all over Europe about the extraordinary qualities of this bird. In 1528 during Hernán Cortés’ first trip back to Spain, he took a turkey to the Emperor Charles V, along with a large amount of products from the New World such as vanilla, squash, potatoes, tomatoes, corn, beans, avocado and an innumerable amount of different fruits that are now eaten all over the world. The English baptized the bird with the name “turkey” or “turkish bird”; the French and the Italians gave it the name of “chicken from Calcutta” since it was considered wrongly so, to be from Calcutta. In Mexico, turkey is eaten in stews, casseroles and used to be served as well with the famous Mole Poblano, the very famous dish believed to have its origins in the state of Puebla, southeast of Mexico City. Nowadays, turkey is very rarely served with the different moles. 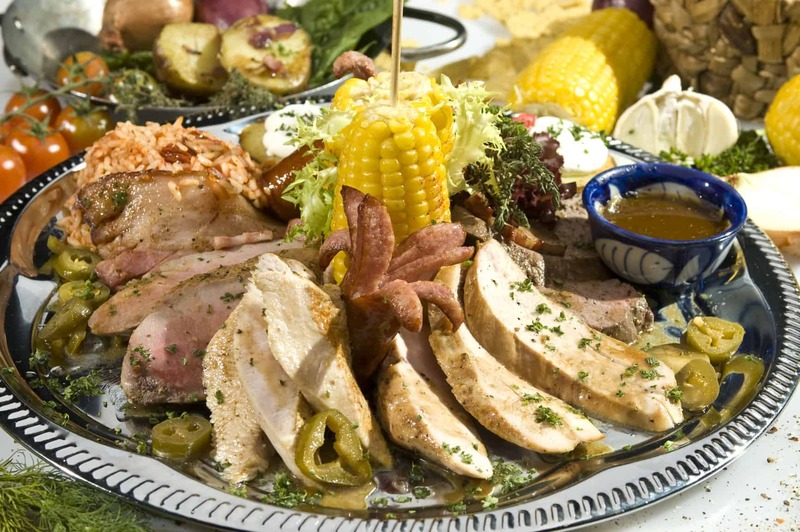 Like many other things, it has gone out of style and chicken is now used more and more in all of the above dishes. As in all catholic countries, Christmas is celebrated on Christmas Eve, and for the same reason, fish is the main dish, however, in the last 20 years, upper class families have started to add the stuffed turkey to the traditional Bacalao, thus substituting the more peasant-like romeritos, a vegetarian dish cooked in dried chiles. In English North America, Thanksgiving Day and Christmas are very close together and the fact that turkey meat, in most cases lasted for a week or so after Thanksgiving, makes this particularly so. For the sake of variation, I would like to introduce a new dish to celebrate Christmas with a festive recipe from the state of Zacatecas, where my grandparents were born. For those of you who have not been in this beautiful colonial city, Zacatecas is situated northeast of Mexico City, and was built around a magnificent baroque cathedral. It has maintained its wonderful colonial architecture, seen all over the city. Zacatecas was originally a mining town with one of the richest silver veins in the world. In fact, in the 1800s, when Mexico was producing two thirds of the world’s silver, a large part of it came from this area. Zacatecas holds a very important place in the art world. It is a state where famous poets and important artists such as the brothers Rafael and Pedro Coronel, painters and sculptors were born, each with their own museum worthy of a visit. This is just a small sample of what you can see in the capital city of the state of Zacatecas. Rinse the chicken thoroughly, inside and out, pat dry with paper towels, and place in a large bowl or directly into the roasting pan. Sprinkle salt and pepper inside and out. In a bowl, combine the vinegar, sherry, onion, bay leaves, peppercorn, and cumin, and pour over the chicken. Cover the chicken with aluminum foil and marinate, refrigerated, for at least 8 hours, turning once and basting with the marinade as often as possible. Soak the bread in the milk until most of the milk is absorbed. Meanwhile, heat the oil over medium heat and sauté the onion until translucent. Add the tomatoes, tomato sauce, apple, raisins, almonds, and olives, and sauté for about 2 minutes. Remove from the heat. Stir in the ground pork, the bread, and the egg. Sprinkle with the cumin and cinnamon and season with salt and pepper to taste. Set aside. Using a baster with an injector, inject about ¾ cup of the marinade into the breasts and thighs, and bake the chicken for about 1 ½ hours, depending on the weight, basting the bird as often as possible and turning it for an even roasting. Serve with the drained pan juices in a gravy boat, with lettuce and chopped radishes on the side. To reheat, cover the chicken with aluminum foil and bake for 10 to 15 minutes, or until heated through. This salsa is one of the most popular salsas in Mexico, mainly because it can be served with any meat dish. Traditionally, it was made with pulque a fermented alcoholic beverage extracted from the maguey cactus, but because pulque is not available anymore, beer or white wine is used instead. Stem the chiles, shake out the seeds, and wash under running water. In a small bowl, soak the chiles in the orange juice for about 10 to 15 minutes, or until completely softened. Transfer the chiles and the soaking liquid to a blender. Add the garlic and onion and process until well blended. Pour the chile mixture into a salsera or a ceramic bowl, add the beer or the wine, and season with salt. Serve the salsa borracha topped with a generous amount of queso fresco, or good Feta cheese. I hope you’ve enjoyed a little more on origin of the turkey, the drunken salsa and a different chicken recipe from Zacatecas. Please comment below your thoughts, and what you’d like me to write about if you have any suggestions. I’d love to hear them! 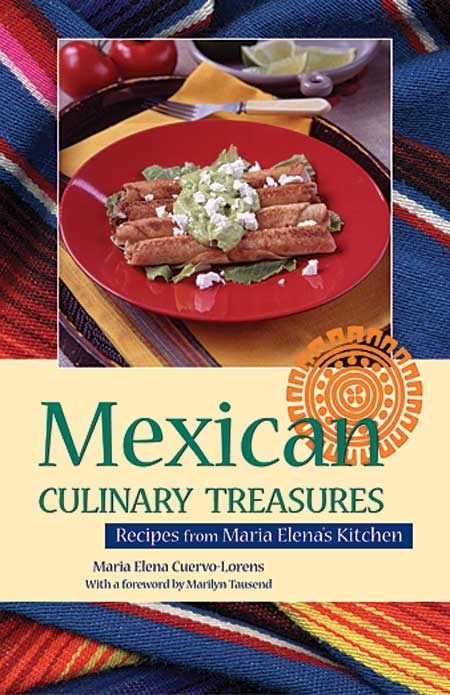 Maria Elena Cuervo-Lorens is the author of Mexican Culinary Treasures cookbook. She takes you back to her childhood, spent around her grandmother’s table on a shopping expedition with her mother to Mercado La Merced, and for a merienda (snack) of café con leche and bizcochos (Mexican sweet rolls) at a bakery in downtown Mexico City. The authentic Mexican recipes she shares with us include tacos, quesadillas and enchiladas. The nouvelle cuisine of cosmopolitan Mexico City, such as cuitlacoche (huitlacohe) crepes, oysters with chipotle chile. 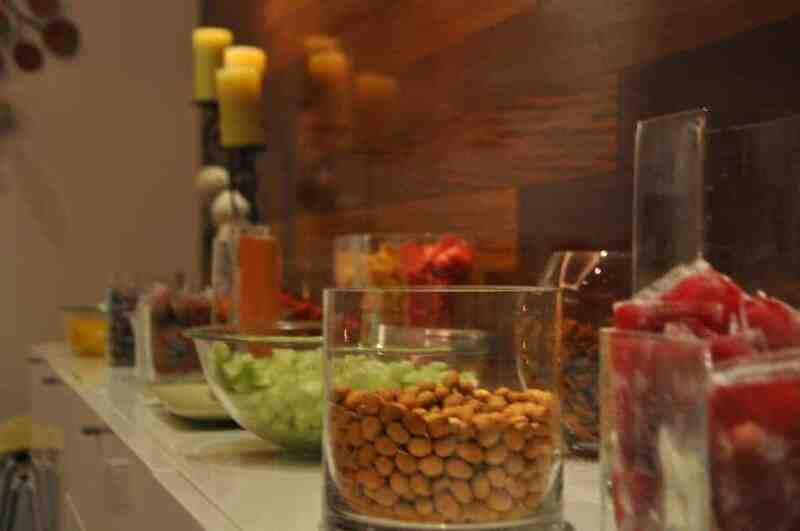 Whether you’re celebrating a party or a get together to watch your favorite game on TV, we bring you a new concept of creating the Ultimate Mexican Candy and Snacks Buffet for your guests. As you will notice, we have chosen a variety of mexican candy, fruits, snacks and chips (most of which you can find on our store if you need them delivered right to your home). Below is a list of the items, but you’re always welcome to choose whatever you like. Make them sweet, make them sour, make them crunch or spicy hot, make them healthy concious, make them colorful, make them simple. It’s real Mexican, real simple and really good. Enjoy! 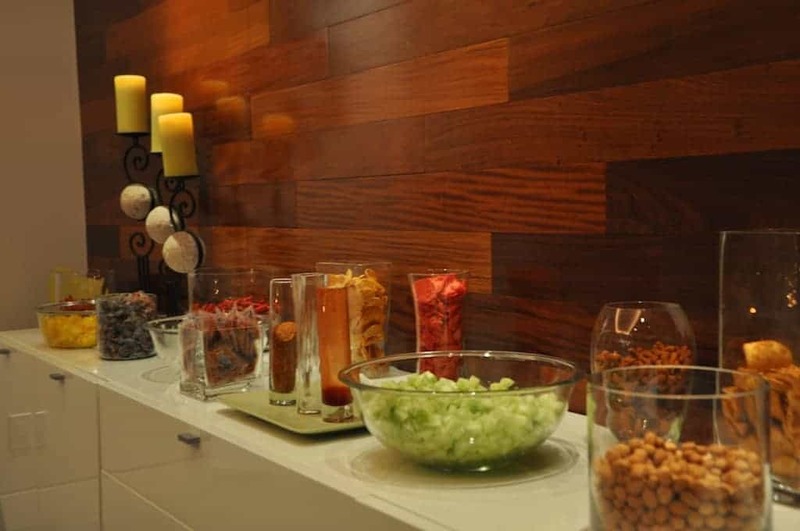 And please share with us in the comment below what your ultimate Mexican candy and Snacks buffet would have for your favorite guests. This uniquely Mexican and Central American holiday features celebrations of family and friends to honor relatives and close friends who have died. The holiday occurs on November 1st and 2nd and is closely connected to the Catholic celebration All Saints’ Day (November 1) and All Souls’ Day (November 2). 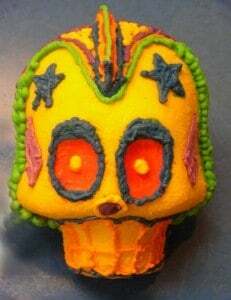 The Day(s) of the Dead traditions include visiting grave sites and building private altars to honor the deceased that include sugar skulls, marigolds, and the favorite foods and beverages of the departed. The altars additionally include photos and memorabilia of the deceased. The celebrations are not morose, but rather humorous as celebrants remember funny events and anecdotes about the departed. Although Americans view the dancing skeletons and celebration of death as macabre or related to Halloween, they are not. El Día de Los Muertos is not frightening but rather reflective, and certainly not sad. The cavorting skeletons originated from imagery of the Mexican press artist Jose Guadalupe Posada, who died in 1913. Posada inspired muralist Diego Rivera and others with caricatures of wealthy people and politicians who were depicted as skeletons. Also on the altars are traditional liquors such as mescal, pulque, and atole, a corn drink. A glass of water is also essential because after the journey from the heavens to earth, the souls of the departed are thirsty and tired. They are also hungry, so the foods both offered and consumed by the celebrants are the favorite dishes of the departed, such as moles and tamales, foods that are made for special occasions because a lot of work is required to make them, showing devotion and respect for the dead ones. For more information on the Day of the Dead, go here and here. For Day of the Dead Recipes, go here and here. 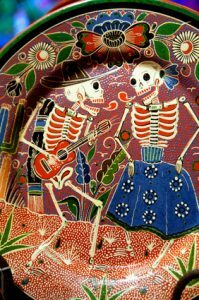 For videos about the Day of the Dead, go here. For great spicy recipes, click the image above! 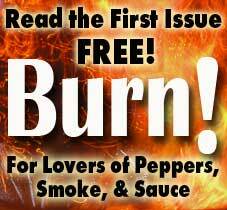 Sweet Heat for Your Valentine! Molcajete y Tejolote A Molcajete is a stone mortar used mostly to grind chiles for salsa. Originated in the state of Oaxaca. Molcajetes come in different shapes, one very popular in central Mexico is the Pig Molcajete.